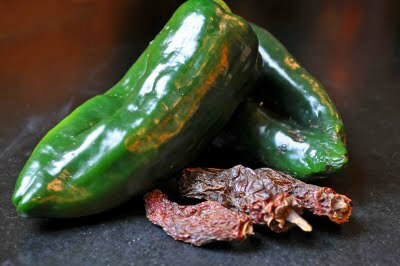 …as well as pasilla peppers (the fresh version of dried anchos) and dried chipotles. So I messed around with it and came up with this recipe. 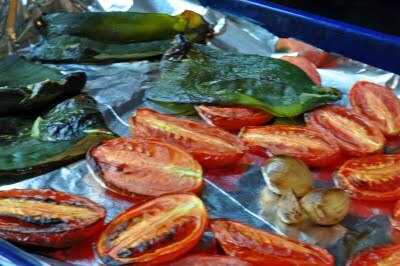 Start by roasting the plum tomatoes (plum tomatoes have less juice and more flesh – if you only have other varieties, seed them first), the pasilla peppers and some garlic cloves. This took about 30 minutes in the oven at 400. While these are roasting, soak the dried chipotles in hot water until soft, then remove the seeds and stems. Puree all of these vegetables together and set them aside. 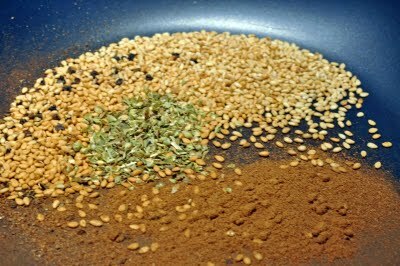 Next, toast up your spices to bring out the fragrance and flavor – sesame seeds, oregano, black pepper and cinnamon. 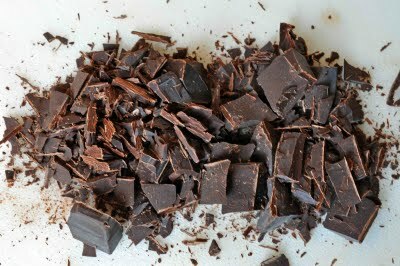 Chop up the chocolate so it will melt faster. 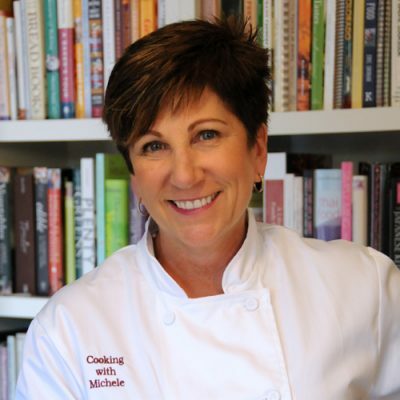 Heat canola oil in a saucepan and add your pureed vegetables, the chocolate, the spices, and a can of tomato sauce. Heat it on low for about 15 minutes to melt the chocolate and bring the flavors together a bit. Another improv, I’m sure, as traditional moles often simmer for hours. But who has the time? And besides, the mole is going to simmer for hours while it cooks with the meat. 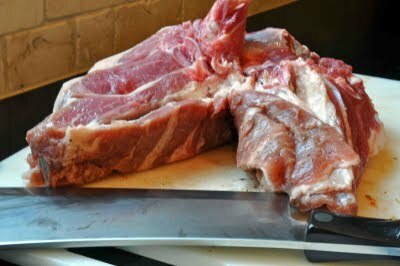 I had this lamb shoulder roast in the freezer – I wanted more surface area in contact with the mole so I used my incredibly heavy and sharp new cleaver to whack it in half. I couldn’t get that cleaver through the big bone (at least without losing finger) so I just left it in there for flavor. 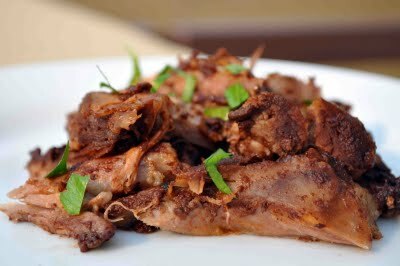 BTW, you could easily use lamb shanks for this recipe and have one per person for a nice dinner party. Season it well with salt and pepper before you sear it off in a heavy pan. See that golden brown caramelization? That’s what makes flavor so make sure you brown it all over like that. Now, here’s where I made a mistake. I poured the mole over the lamb in the large Dutch oven and cooked it like this. But the mole tended to reduce too much and burned quited a bit in the process. I’ve written the recipe instead to wrap the mole coated meat up in foil to bake it so no juices get out and no air gets in. I think you’ll get a much better result. Hence, the traditional technique using banana leaves to wrap it and bake it. It needs to cook for a good 3-4 hours before you get this fall-off-the-bone texture – and I mean that literally. I didn’t use a knife at all – just pulled the meat off and put one piece in my mouth for every piece I put on this plate to photograph! Heat oil in a large skillet. Season lamb on all sides liberally with salt and pepper, then sear in skillet until a brown crust forms on all sides. 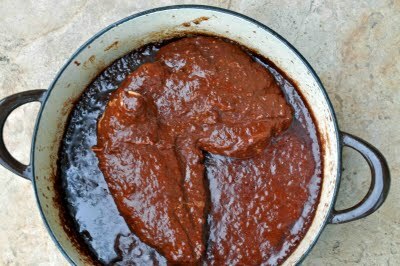 Lay browned lamb in a piece of heavy duty aluminum foil and pour mole sauce over. 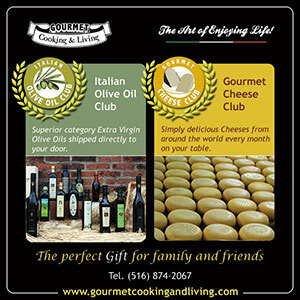 Seal tightly so that no air escapes and the sauce won’t leak out. (Double foil is a good idea.) 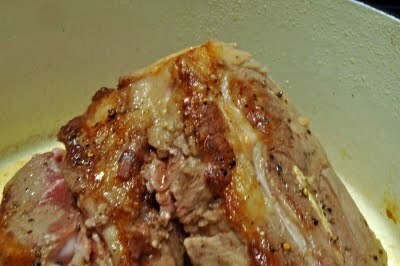 Bake at 325 degrees F for 3-4 hours, until lamb is tender and falls from the bone. Soak chipotle peppers in hot water until soft. Remove seeds and stem. Puree chipotles, roasted peppers, tomatoes and garlic until smooth and set aside. Toast oregano, cinnamon, sesame seeds and pepper until fragrant. In a saucepan, heat canola oil, then add pureed vegetables, spices, chocolate, salt and tomato sauce. Heat until chocolate melts and then continue to simmer, covered, for 15 minutes, stirring frequently. If sauce is too thick, add water to thin as needed.